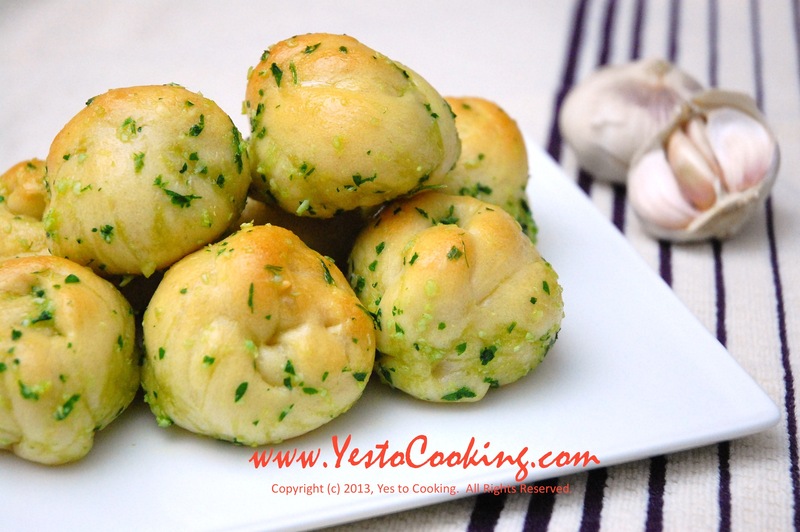 Garlic knots are a traditional snack found in Italian pizzerias, which thriftily use pieces of leftover dough by baking and rolling them in a garlic-parsley butter sauce. These knots are golden brown and crusty on the outside; yet, chewy and light on the inside. While you can definitely step by your local pizzeria for your garlic knot fix, you can also whip up this recipe for yourself or for stunning your party guests. I like to call this a “healthy” version of the traditional garlic knots because the recipe uses olive oil instead of butter. Before getting started, be sure to check out the Basics: Pizza Dough recipe which you will need to prepare prior to making the garlic knots. 1) Place risen or defrosted pizza dough on a lightly floured surface and roll dough into a large rectangle (approximately 16 x 12″ and .5″ thick). 2) Cut dough into strips about .5″ wide with a sharp knife. With a loose hand, tie each strip into a knot and place on a baking sheet lined with parchment. Leave a 2″ space between each knot, because the dough will rise. 3) Cover knots with plastic wrap or a clean kitchen towel. Let rise in a draft-free place for about 30 minutes until dough doubles in size. Sprinkle the tops of the knots with salt. 4) Pre-heat oven to 375F towards the end of the rising period. Uncover the knots and bake until golden brown and risen, about 30 minutes. 5) Meanwhile, stir to combine olive oil, minced garlic, and parsley in a bowl. 6) Remove garlic knots from oven and transfer immediately to a large mixing bowl. Toss gently with the garlic mixture. Add salt and pepper to taste. Serve immediately. The dough will be sticky at the cut edges, while you tie the garlic knots. Lightly dust the edges with flour to make the dough more workable. Have leftover garlic knots? No worries! Just microwave the garlic knots for a 15-20 seconds the day after baking and they’re good to go. Drizzling some olive oil and chopped sundried tomatoes make day-old garlic knots even more delicious. Tags: bread, garlic, garlic parsley bread, garlic parsley knots, italian, italian appetizers, italian garlic knots, italian snacks, parsley, pizzeria snacks, western. Bookmark the permalink. Beautiful. This is such a perfect snack for a picnic. Absolutely, it could work as a picnic snack or party appetizer too! Thank you! I grew up going to the pizzerias in the neighborhood for garlic knots and was so excited to write this recipe up. Great idea for a party treat! Yes, it would be great as an appetizer before dinner! Thanks for the excellent read!